What a topsy-turvy ride! One attendee who saw the summary mural said, “Love the roller coaster to the cloud concept. You nailed it!” This is what visual thinking can do — nail a concept in such a way that you can hang your hat on it. 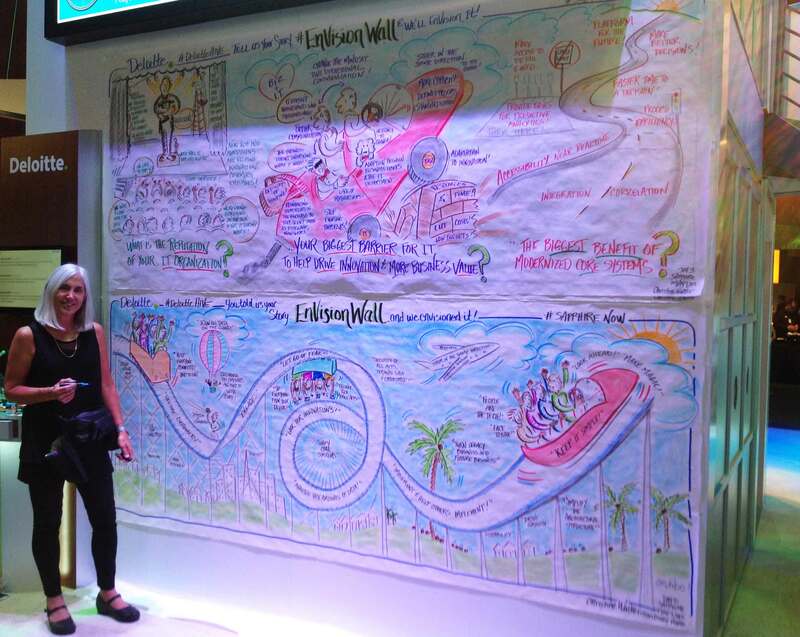 Christine Walker visual facilitation at SAPPHIRE NOW for Deloitte EnVision Wall. What sparked the roller coaster metaphor for me was an attendee’s comment to “Let go of fear!” He was speaking specifically about people’s reluctance to fully embrace mobile and the cloud, yet the imperative related to other concerns about cyber security, culture shift, core systems, and the speed of change. Also, the view from my hotel window of a giant ferris wheel rising from treetops a few miles away and the surprise launch of a hot air balloon on the hotel lawn below my balcony energized the drawing. We humans live in our bodies and senses. We relate more readily to the tangible world than an abstract landscape overly populated with jargon “maximize!” “leverage!” “aggregate!” or acronyms “ERP!” “MIS!” “IOT!” Letting go of fear could be letting go the handrail while spinning upside down on an amusement park ride, flying miles high above ground (on a hot air balloon or an airplane in a storm), or deciding to put our businesses and personal lives in the cloud. However we value thrills or progress, they come with risks and discomforts, as well as rewards. The summary mural built from three days at the Deloitte booth, when Bryan Pray and I listened to the varied and thematic concerns and ideas of the conference attendees who stopped by the EnVision Wall. Sparked by questions prepared ahead of time by Deloitte, the answers revolved around business and technology priorities, disruptions, opportunities, investments, core systems, enhancements, changes, measurements, and strategies. In text, illustrations, and visual metaphor, I drew five murals highlighting the attendees’ pressing and nuanced concerns. The Roller Coaster to the Cloud contains highlights of the three days, including these imperatives: Engage customers over their lifetime. Turn legacy business into future business. Let go of fear. Look for innovations. Analyze vast amount of data. Use predictive analytics. Improve security for all apps, personal data, and cyberspace. Simplify the architecture. Implement and help others implement. Keep it simple. Look ahead. Make magic! Note: Bryan Pray and I attended in affiliation with Live Marketing. I was also there in partnership with Visual Ink Creative. I enjoyed the event and appreciate these creative affiliations. Thank you!